Flowers are an important part of every wedding. The colours type of flower arrangements you choose have a big impact on making your special day even more memorable. Here are five tips to help you put the final changes on one of the most important days of your life. Decide which of these are must-haves for your wedding, and take note of particular flower types that appeal to you. Share this information with the florists you choose to visit in the next step. Be sure to take a notebook with you. Write down the floral shop name, address and the name of the person you spoke with, and then record the price range they quoted and the type of flowers and arrangements they suggested. Do this for each florist shop you visit. It is important to ask each florist the same questions so you can compare their responses and prices. Get a feel for whether you would like working with that particular person or shop and indicate this in the notebook. A good florist will be able to work within your budget by mixing and matching expensive flower types with less costly ones to create beautiful arrangements. Be sure to make use of foliage to help cut down costs before making any final decisions about wedding flowers. 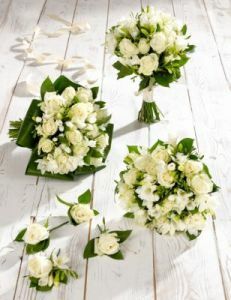 It is important to consider the season in which you will be getting married and to choose as many flowers as possible that are in-season at that time. Paying attention to this step can make a huge impact on your flower budget. Buy from local flower producers if you can. 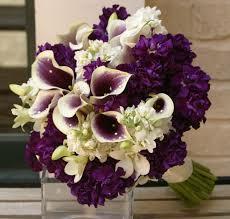 Chances are, the flowers will be much fresher than something that has been transported. Whether you are on a limited flower budget or the sky is the limit, the bridal bouquet deserves to be magnificent, even if it is simple in design. The bridal bouquet is the most important wedding flower arrangement and deserves careful planning and a larger budget than the rest of the wedding flowers and arrangements. Design it first. Here are some things to consider. While white has been the most traditional bouquet colour, many brides bouquets today use anything from soft pastels like ivory, pink, peach, blue or yellow to rich, deep, vibrant colours either as accents, or throughout the whole bouquet. Popular colours include red, burgundy, violet and mauve. • Traditional Wedding: A bouquet of cascading flowers works well in romantic, traditional weddings and looks best with full-skirted gowns. However, a bouquet like this is over-powering when the bride is wearing a sheath type dress or any other close-fitting style. 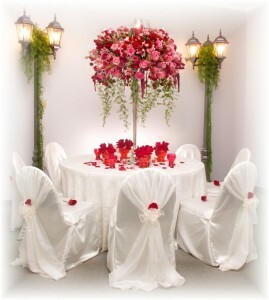 • Contemporary Wedding: A bouquet of exotic flowers is particularly suited to brides wearing a simple but elegant dress. Be sure to include some tropical foliage. Another choice for the modern bride is a tied bouquet consisting of several complementary flowers and colours, or a small and simple posy bouquet. Many brides preserve their bouquet, so if you are sentimental, you may want the flowers in your bouquet to be significant in some way or send a message. Perhaps you want the number of flowers to represent the months you have been together and buds on the sprays of baby’s breath to signify all the years to come. Maybe you want to include the first flower the groom gave you. Other items you may want to consider designing into your bouquet include the first ring or piece of jewellery he gave you when you knew the relationship was serious. Or maybe you have found a particularly wonderful wedding day charm to make the bouquet personal. To add glamour and distinction to your bouquet, incorporate crystals or pearls. Twisting in lace, satin or organza ribbons amongst the flowers adds a feminine touch. 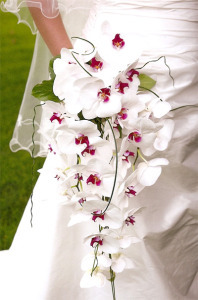 Use your imagination and be creative as you consider ways to bring meaning and sentiment to your bouquet. Read more about 5 Steps to make a hand tied posies bouquet. Browse through both modern and vintage wedding photos to see if you can add drama and flair to your flower arrangements by using colour and containers in unusual ways. Add apples, lemons or limes to the bottoms of clear vases filled with tall stalks of flowers for table centrepieces. Non-traditional items can include items from nature like tree bark and grains, or vegetables such as colourful kale. Rely on your florist for help.